Kamla Nagar Market, the Lajpat Nagar Market and the Sarojini Nagar Market are some of the best places in Delhi to look for handbags. The prices of the handbags are very reasonable and there is a lot of choice in style and design. As a matter of fact, one can get easily confused with so much choice. A simple solution would be to walk into one of the best shops for handbags and purses in any of these markets. We walked into the Bonito shop in the Kamala Nagar Market. This is a popular market with the students as it is very close to the Delhi University. Students are always on the lookout for bags. They would like to have a distinct bag for each occasion. They would need a convenient bag to carry to the college, an all-day bag when hanging out with friends, an evening bag and a glitzy bag and so on and so forth. First, this shop has quite a large collection of handbags, backpacks and travel luggage. The prices start from Rs. 300/piece and goes up to Rs. 3000/piece. Handy purses, just right to place a wallet and a phone are one choice. They are small, lightweight and handy. The next is a slightly bigger sized bag that can probably accommodate a make-up kit and the phone and the wallet. This kind of bag was available in a variety of shades from beige and light brown to deep reds and maroon. This bag could be carried by young girls and their mommies too. They have contrasting coloured straps to make them more attractive. We particularly liked the black handbag with pink and yellow handle. It has a smaller pouch that can be placed inside it. Then there were backpack bags. Large bags to fit in books, wallet, phone, makeup and snacks. They had pockets on the outside to enable easy access to that area. Red and cream-colored bags with a bit of gold work on the sides looked attractive. Then of course they had a copy of the Burberry design bags. Large and commodious bags. The handbags in gold colour and dull gold colour were particularly attractive. 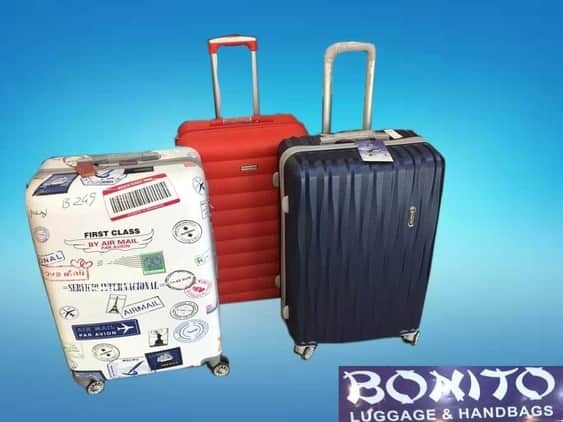 Bonito also stocks suitcases in 3 sizes. We liked the suitcase with the newspaper print design on the outside. You could easily identify this suitcase in the airport carousal unlike a black suitcase which is very common. The luggage was sturdy and comfortable and budget friendly pieces. This is not just another shop with traditional Indian prints on kurtas, kurtis, tunics, salwars and tops. There is a difference. The designs have Indian gods and goddesses, folk prints, cultural motifs and other ethnic designs on very contemporary style clothing. The colours are vibrant reds, blues and greens and the fabrics are of all kinds. The clothes really stand out with the liberal use of Indian colours and dyes. The tunics cost around Rs. 600 – Rs. 800 each, while the kurtas wear a price-tag of Rs. 600 – Rs. 1000 per piece. Very Indian, very desi yet modern nonetheless. A spunky global style statement by designer Anita Dongre who has a half dozen inimitable labels to her credit. “The Shooz Mall” says the tagline for Forever Shoes And it sure is – full of choice footwear for men, women and children. Accessories like bags and belts are a bonus. From funky flats in yellow and pink, striped ones in cloth and ethnic flats and sandals, six-inch leather heels and stone studded party wear, this shop is definitely a shoe-haven for college students. Very trendy, not pricey. The simpler flats cost Rs. 500 while stone-studded ones command Rs. 1,500. High-heels range from Rs. 1000 to oops…Rs. 4000 for what is dubbed wedding wear. Don’t stumble, pick what you need. If it is a special occasion, look for matching clutches and bags …strike a deal. Reasonably priced fabrics and dress materials in chiffon, georgette, crepe, cotton and lace are available here at Tac Fab. There is an old world charm about the prints, and the Lucknow style chikankari (embroidery with white thread) which lends a lacy finish, is a real delight . The unstitched cotton suits, saris and kurtis in different shades and simple patterns are very attractive . Of course there is no escaping the fashionable garments ; so there is a smattering of grand suit pieces in silk and chiffon as well. You will find the same shop in Karol Bagh as well – not one, but two. In Kamla Nagar too there are two outlets, but the second is called Classic Collections.